PitPass sometimes do a very useful thing when it comes to practice times - they publish a listing of aggregate times for two sessions combined. They have done this for Friday in Hungary and it makes interesting reading. Naturally, we go down the list to see who is quickest but there is an odd little snippet buried within the times: Massa was the only one who failed to go faster in the second session. That is unusual in itself, the little Brazilian generally becoming quicker as the weekend proceeds, but it is also notable that Raikkonen has uncharacteristically gone quicker than his team mate in practice. It seems that the Finn is taking this one seriously. He will have a difficult job tomorrow and on Sunday, however; the Ferrari does not seem to have caught up to the McLarens as yet and, indeed, were outpaced by the Renaults. Yes, both of them - Piquet second fastest and apparently ready to prove that Hockenheim was no flash in the pan. Renault's rise to prominence should not surprise us, it being usual for them to improve at an accelerating pace through the season, but they have not quite arrived as yet. In qualifying they tend to get buried amongst those teams who have been concentrating on race set-up in practice, BMW and Red Bull generally finishing higher up the grid. I expect the same to happen here but the improvement in the Renault is becoming very obvious and they could threaten the top three within a few more races. BMW look a good deal more promising than they have done for a while. Remembering that they are the great sandbaggers of practice, their Ferrari-like times today must make them contenders for the front two rows of the grid. And Heidfeld is quicker than Kubica, surely proof that he is over his tire-warming problems. The BMW may not threaten the McLarens yet but Ferrari must be very worried. Perhaps the biggest surprise is the mediocre performance of the Red Bull pair. After becoming a factor in the battle for third fastest team, they have slumped here and even Toyota have slipped ahead. This may be a matter of the Newey chassis not being as good on tight circuits; it is hard to judge since our usual yardstick, Vettel, had a troubled time today and was not able to show how quick the STR can be. I suspect that both teams will find it difficult to make it through to Q3, however. Williams and Toyota seem to be marking time on the development front, very much midfield at this circuit. And Honda and Force India bring up the rear as usual. This is more an indicator of how competitive the sport is at the moment than a matter of inability to cut the mustard - discounting Vettel's times, less than two seconds separate the dominant McLarens from the slowest car on the grid. When such small margins are involved, it takes only a minor tweak to send a team rocketing up through the order. Hence the proliferation of shark fins, of course. It is obvious that this modification gives only the slightest of improvements, if any, but each team has to try it just in case. The first team to stumble upon somethjing that makes a significant difference is going to look very good for a while. This post turned out to be a lot longer than intended. I watched the second practise session live and although it was quiet in terms of incidents it was interesting and I think informative. 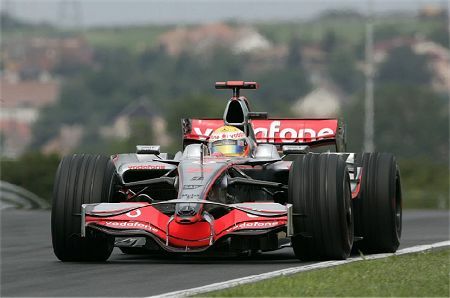 Although Renault finished well up in the times they were nowhere for most of the session then in the last 15 minutes Alonso put in a few laps around 4th - 6th position and Piquet who had rarely appeared in the top ten pulled out one monster lap to go second. I doubt that these times are remotely indicative of their real pace. Similarly with Red Bull. Although they finished in the middle of the times DC was about one tenth behind Webber when normally there is more of a gap so I expect when the chips are down that at least Webber and possibly DC as well will make Q3. THe Ferraris finished FP2 0.001 seconds apart so if Massa has some performance in hand as suggested by the FP1 performance Kimi could be in trouble again. Heidfeld finished around a quarter of a second up on Kubica and like Piquet this was a late flyer as before that his best lap was 5 tenths slower. However where Piquet and Alonso were probably exploring the ultimate empty tank pace of the Renault Heidfeld was probably just stepping up from the usual BMW sandbagging position to post a representative time. All in all the top eight or ten in qulifyin should be very close tomorrow and the differenc between guessing the fuel right and dlivering a great lap and failing even slightly in either of those areas could easily be 6 grid slots. Only the McLarens seem to be ahead of the bunch and although Lewis finished slightly ahead he and Heikki swapped fastest laps and sector times for most of the session. What could be worrying for the others was that on several occasions in the second half of FP2 both McLaren drivers were on great laps and mysteriously dropped several tenths in the third sector despite there being absolutely nothing wrong with that area of the track. On one such occasion Heikki set the fastest time of anyone in sector one which Lewis beat a few seconds later and when the reached the end of sector two Heikki posted his best second sector of the session and Lewis poste THE best second sector time but at the finish line neither of them were close to a faster lap. Following Lewis at a distance of a few seconds Heidfeld beat all three of his own best sector times to post his fastest lap of the entire session. So either the McLarens both made a set up change that hampered them in S3 or they were sandbagging. It certainly looked to me (I was watching live timing only) that the McLarens were sandbagging, Steven - it was greens and purples for them all the way and then a sauntering sector 3. The other teams must be dreading the race, if that is the extent of McLaren's advantage. Agreed, too, with the rest of your assessment, although I would add that Heidfeld has not been able to equal Kubica's times in practice this season, even with a one-lap flyer. I reckon he is back where he ought to be now and qualifying will show whether I am right or wrong. You're right, Becken, qualifying is going to be very interesting. It certainly looks as though Ferrari are going to have to run light if they want pole.